From the moment ISASC member Jack M. saw this iron and brass barrel-type computing scale manufactured by The Computing Scale Company on eBay, he knew he had to have it. The Buy-It-Now price made purchasing it easy. The seller’s location in Akron, Ohio – nearly 450 miles from Jack – made receiving it much less so. The scale now holds a place of pride among the 200 or so in his collection. Although the scales are displayed throughout the whole house, he does have one room that’s kind of set aside for them. His one exception, though, is this particular scale which stands alone in his living room. He hasn’t learned much about the scale’s history. “The gal that was selling it told me her dad had it in his grocery store. He didn’t really use it, but had it on display.” Given the scale’s age, it’s really no surprise it wasn’t in active use even a generation ago. 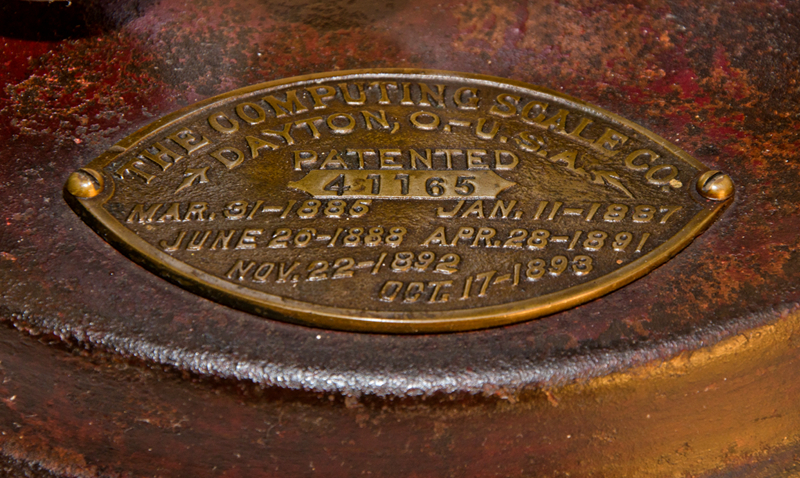 The brass plaque at the base of the scale lists six patent dates, the most recent being October 17, 1893. 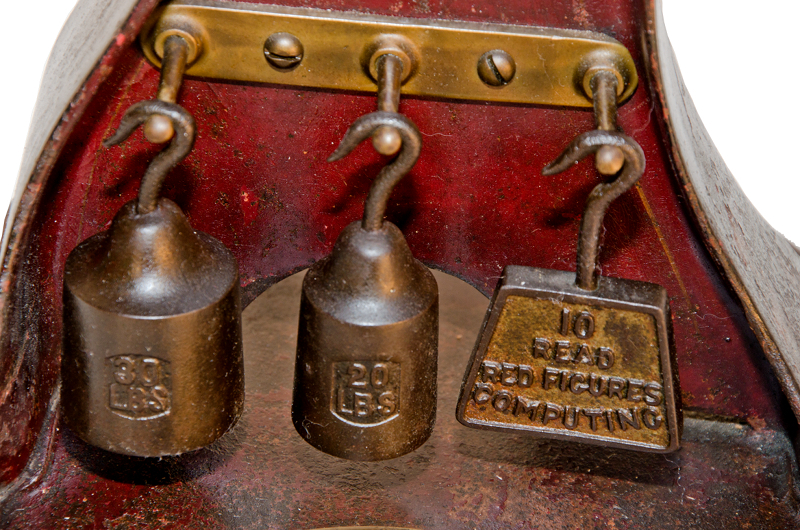 Indeed they were, so much so that in 1933, the scale manufacturer, by then known as the Dayton Scale Company, became a division of International Business Machines – more commonly known today as IBM – and one of the founding companies of modern computers. 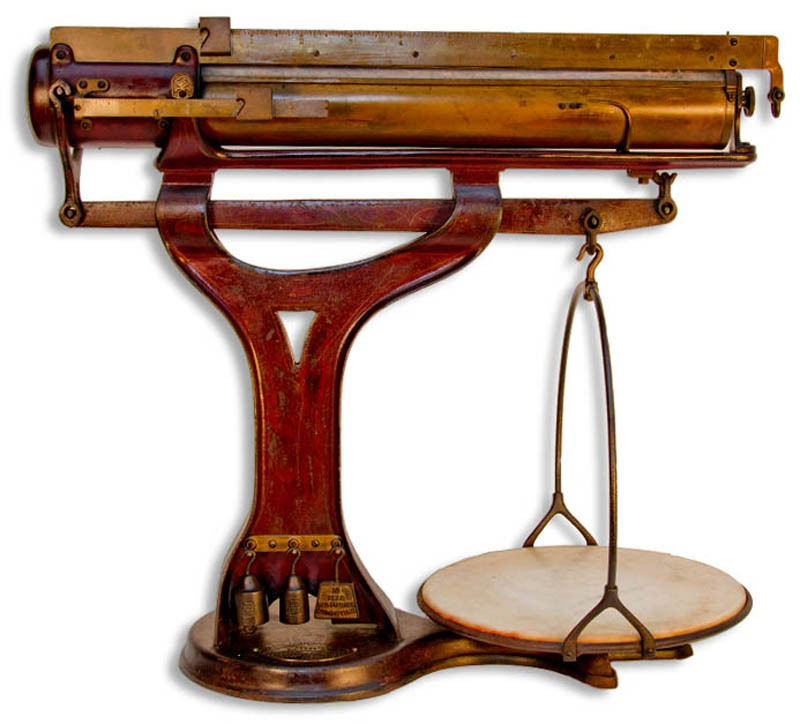 With its original paint and decorative gold pin striping on the cast iron body and patinaed brass elements, the 27-inch tall scale is quite handsome, enough so that Equilibrium featured it on the cover of Issue No. 4 in 2017. What makes this scale so unusual is the integral storage place at the base of the scale for the three hanging poises. Like many ISASC members, Jack got into scale collecting almost by accident. “I always liked mechanical-type things,” he recalled, explaining he first started collecting what are known as hit-and-miss engines before getting hooked on scales. Imagine a large stand-alone kerosene-powered engine in a farmer’s shed with a broad flat belt that attached to whatever needing powering – a washing machine, a cement mixer, a wood saw – and you’ll have a pretty good idea of what such a machine looks like. While Jack still has a half dozen or so hit-and-miss engines – named for the distinctive sound they’d make when their set operating speed was exceeded and they cycled without firing – he found that scales also spoke to him with their mechanical precision. Even better, “they were a lot smaller and a lot lighter” than the engines. Jack learned about ISASC early in his scale-collecting pursuits. “I ended up at an auction where there was a scale I was after. A couple of other guys were bidding against me. I didn’t know at the time they were members of the Society. I didn’t even know there was a group for scale collectors!” Afterwards, seeing Jack’s interest in the scale, the ISASC members introduced themselves and told him all about the organization, leading him to join ISASC in 2003. This Scale Tale was contributed by Jack M.